GDA-HLB1 is a simple adapter for all Gicren&apos;s standard devices. 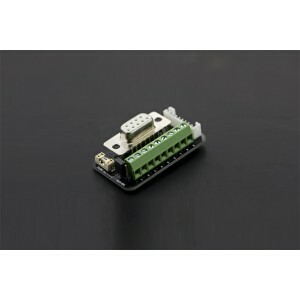 The onboard high-quality D-Sub-9Pin-Female, DIP-PH2.0-9Pin, Header-2.54mm-Pitch-9Pin, Terminal-Block-3.81mm-Pitch, fuse and selectable matching resistor make this adapter more flexible and reliable. It could cooperate with Gicren Drivers (SoftServo-B10CH (Servo Controller/ RC Signal Generator) / SoftServo-B24CH (Servo Controller/ RC Signal Generator) / DRI0037 / DRI0038) directly.